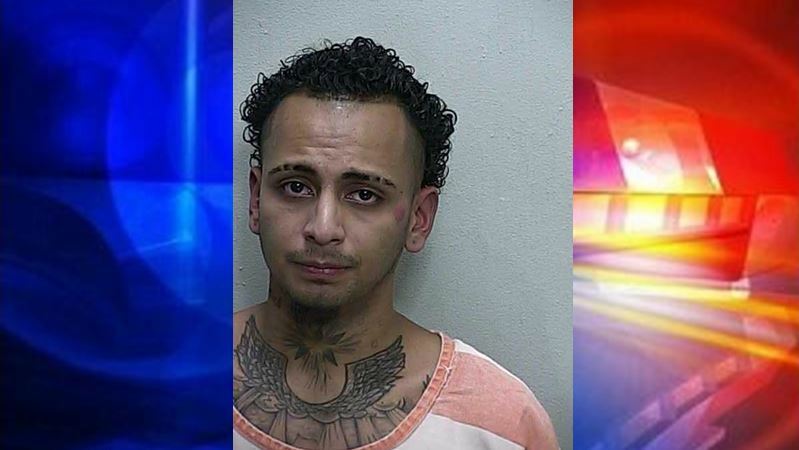 Ocala, Florida — A 24-year-old male faces multiple felony charges after he attacked a female who gave him a ride home. The victim told Ocala Police that she was at Cowboys Saloon, located at 718 South Pine Avenue, Ocala, selling roses to customers when Emerson Ferrufino, 24, approached her and asked for a ride home. She stated that she had known Ferrufino “for a while” so she agreed to drive him to his Ocala home. The victim said Ferrufino then reached across her body with his right arm and put a knife to her throat. Police said that was when the victim pulled into the Marathon gas station, located at 1010 South Pine Avenue, and called 911. Moments later, Ocala Police Officers Moorehead and Ferguson pulled into the parking lot. They reported that the victim was running away from her attacker as they were arriving. Police made contact with Ferrufino, who was standing near the victim’s vehicle. While speaking to the suspect, police observed a folding knife on the ground where he was standing. Ferrufino told police that he had not done anything wrong. Instead, he claimed that the victim had attacked him. He told police that the victim had cut his hand with a knife, but the victim said that the cut was already on Ferrufino’s hand when he entered her vehicle. Ferrufino also stated that he and the victim were a couple and had a child together. However, the victim told police that she does not have a child with Ferrufino and that the two were not together. EMS responded to the scene and treated the victim and bandaged Ferrufino’s hand. Ferrufino was then handcuffed behind his back and transported to the Marion County Jail. Police reported that Ferrufino was uncooperative and was not coherent. Upon arrival at the jail, police discovered that Ferrufino was able to move his hands to the front of his body. He had also unbuckled his seat belt. Additionally, Ferrufino had removed his bandage from his hand and attempted to eat it. As the officer attempted to remove Ferrufino from the back of his patrol car, he refused to comply, “jerked away,” and began to swing his arms at the officer. The officer had to grab Ferrufino with both hands to gain control. While Ferrufino was being searched inside the jail, corrections officers located two baggies of cocaine — one in Ferrufino’s underwear and the other in his right sock. He was charged with Aggravated Battery with a Deadly Weapon, Possession of Cocaine, Possession or Use of Drug Paraphernalia, Smuggling Contraband into a Detention Facility, and Resisting Arrest. Ferrufino has had previous arrests for Domestic Battery, Retail Theft, Possession or Use of Drug Paraphernalia, Violation of Probation, Aggravated Battery on a Pregnant Woman, and Child Neglect. He is being held on a $27,000 bond.